What kind of BBQ grill to buy? This may seem like a silly question but I want to buy a good, long lasting, high quality BBQ grill for outdoors and have no idea what is a good make or brand or what type to get? Whatever is best for my health would be optimal! I should also mention that I live in Dubai so an international brand would be helpful. If not sure of any particular brand that sells out here, then maybe a certain type of grill? Any help would be great. My barrel only has one chamber, with a burn basket on the bottom. It's good for short hot smokes (2-3 hours max, or you have to do a clumsy reload with fuel)and wood grilling. I should have mentioned that I live in Dubai! So preferably something I can buy out here. Also, if you don't know specific brands that sell internationally, maybe just recommend a type of grill? 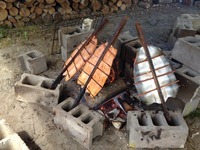 I've got the Smokey Mountain and the One Touch Gold - and the site has some wonderful tips and recipes. Many paleo - though I don't think they know that! I personally love the "barrel" smokers. They are awesomely versatile - you can do direct heat for hot grilling in either the main chamber or the side "fire-box" or indirect heat for slow-smoking meats by putting the fire in the fire-box and a big chunk on meat in the main compartment - or you can do both at the same time. The brand doesn't really matter as long as you get one made of good heavy-gauge metal (holds heat better). I got a question for you grill pros out there. I'm new to this but I've recently gotten a little bit more time on my hands and I've started trying to bbq a lot more and I'm loving it! So my wife is allowing me to buy a new grill because she's getting into it too. anyways i'm not sure what to get and I've been looking around a lot. I found this website http://www.squidoo.com/what-is-the-best-bbq-grill and I'm loving the Weber Genesis E-330 model and i've read a lot of reviews and they all seem to be good. what do you guys think? any suggestions? I was a long-time Weber fan, and still am. However, my landlord (who lives nearby) has owned Char-Grillers as his past two grills. I managed to snag their Super-Pro model for $40 off the retail price at Lowe's earlier this season. It's been nothing short of fantastic. I would also suggest (if you have the money) the Big Green Egg. I've heard nothing but good things about it. there's only one grill worthy of consideration: the big green egg! food from an egg tastes way better than from a weber, you can cook low and slow for hours without adding more charcoal, you can blast the thing up to 700 degrees to sear the crap outta your steaks, the egg is the only grill you need. I'll second the Weber recommendation. I don't think their grills can be beat when it comes to prices vs. performance. And I use it ALL the time. Super handy. Fast.